It's always great to be back in the Napa Valley, visiting old friends or as in this case making new ones. It was my great privilege, getting to know Felicia and John Tudal this past weekend. You'll find their fourth generation winery located on Big Tree Road, located in St. Helena off route 29, just a few miles down the road from Calistoga. It's easy to miss if you drive too fast, it's the exit before or immediately after the Cal-Fire Station, depending on your direction. If you'd like to visit and I suggest you do, it's like taking a step back in time to the classic days of the Napa Valley when things were much simpler, and tasting rooms were not built to resemble the Taj Mahal. Please note, that their tastings are made by appointment only, but that is a relatively simple thing to do of course. Seeing their 10-acre winery is what you'd call off the beaten path, slipping onto their tasting schedule should be a snap, but as always, please call ahead. For the more inclement weather days, they have a small tasting salon located nearby the Tractor Shed, the outdoor tasting with the view of the lovely garden and vineyards is ideal. The view of the garden above and below the vineyard view. Now I could go on to describe my experience here and I will. I was a guest, who was there to see, taste, listen, and drink it all in. Personally, I don't just look at things through the lens of a wine-writer, but I do so more like each one of you, as a wine consumer. One who decides where I want to spend my time and my hard earned dollar, Tudal Family Winery is one of those places. That said, what you see is what you get, a historic Napa Valley property one that has much to offer the average thirsty vino-sapiens looking for something different, instead of the run-of-the-mill cattle-call tasting rooms. This is an opportunity to sit back and relax, take it all in and enjoy a slice of the Napa Valley as few ever really get to see it. In the next picture, you'll see why the voice of previous visitors will ring so much more accurate, than the words I can convey here in this article. Their guests are invited to write on the door, to share their experiences. As I read through them all, I thought this is the kind of winery I want to visit when I have a long weekend, or just a couple days off from work. 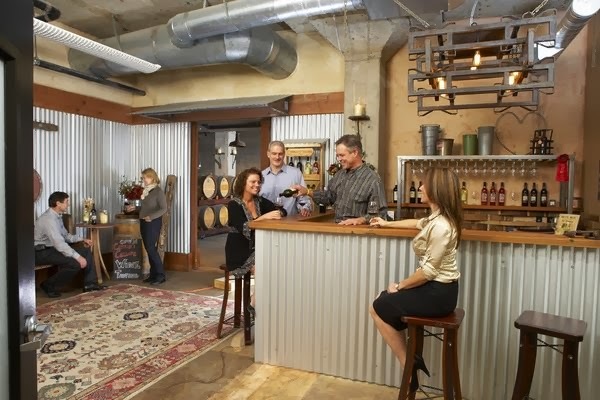 If you find that you can't make it all the way to the winery; then join them at their Cerruti Cellars urban wine oasis in Oakland, Ca located in Jack London Square. It's named in tribute to our patriarch and 1st generation California Grower George “Baci” Cerruti, an Italian immigrant from Genoa who lived to the ripe age of 99 witnessing so much growth of an industry he helped pioneer. This is a great little spot to sit back and relax after work, a place where you can also catch a taste of their 'lifestyle' brands, Tractor Shed Red [$12] and their well placed Honker Blanc [$15] which is also seeing some action in the Napa Valley via their keg wine-by-the-glass service. As you know, I'm not a big fan of domestic Sauvignon Blanc, I tend to prefer the old world styles of the grape from Fie Gris or Sancerre, new world styles are often too rough around the edges. But what I tasted of the upcoming Camp Ranch 2012 SB I'm thinking it's going to be a tasty one (no mal) and one I'd recommend for those who don't prefer the flavors of freshly cut grass and overwhelming grapefruit notes, instead of a gentle slap of peach, citrus, and papaya. Riding around shotgun on their gator with Felicia Tudal, I had a fun opportunity to take in some of the backroads of the Napa Valley, a brief back-road excursion very few ordinary visitors have a chance to do. I was able to meet many of their neighbors, friends, growers, and vintners. I purchased a bottle of Cabernet Franc [on Felicia's recommendation alone] from the folks at Ehlers Estate, who had a very comfy and spacious tasting salon (stay tuned for that review). The suggestion she gave me reminded me of something she said earlier as I was through a few of their wines at lunch, "Dirt doesn't lie, it's the basis for good wines". Folks there's an undeniable truth to that statement, one I've experienced more times than I can tell. My first day on the property, right before a fantastic lunch we shared, I had the opportunity to do a bit of barrel tasting, something which I always enjoy. A quick glance if you will need about what one could expect from the upcoming release. Based on those impressions alone, I'd say that both 2012 and 2013 Tudal Family "Clift Vineyard" 100% Cabernet Sauvignon (clone 337) is going to be a blockbuster. I was especially impressed with their 2013 which is just bursting at the seams with finesse and power. But don't get me wrong, their 2012, is a velvet glove, (free-run/press) dark ripe blueberries, mocha, blackberry, and a ripe plum laid across a canvas of bright acid, making everything pop. The fruit for this wine is sourced from a near dry-farmed vineyard, called Clift Ranch. Longtime Napa Valley grower Tom Clift planted the vineyard in 1999, and in its 15th year is showing its maturity. A delicious single-vineyard Cabernet Sauvignon designates from a vineyard which is a little less than two acres, located in the heart of the Oak Knoll District of the Napa Valley. There's already quite a bit here, and I've so much more to tell about this amazing Napa Valley winery that's surprisingly still flying under the radar. It's my hope you'll take my advice, book an appointment and meet some great folks behind this excellent Napa Valley producer. Look for part two tomorrow, until next time folks remember life is short, so sit back, relax and uncork a great Tuesday evening cheers!